Aiteo Cup: Sunshine Stars, Wikki, Katsina United Through To Round Of 32 – Royal Times of Nigeria. 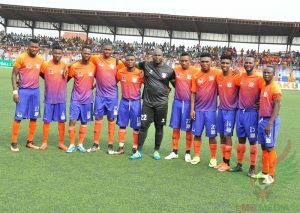 Sunshine Stars have secured their passage into the round of sixteen of the Aiteo Federation Cup after edging out non-league outfit, Confine FC two-nil in their round of thirty-two encounter in Warri on Monday. Ajibola Otegbeye scored both goals for the Owena Waves in the seventh and eightieth minutes respectively. In Abuja, Dominic Abah hit the back of the net three minutes from time to hand Katsina United a one-nil win against Osun United. At the Aper Aku Stadium, Makurdi, Wikki Tourists zoomed into the round of thrity-two courtesy of a four-one win against Bayelsa United. Kwara United dispatched Mighty Jets three-one to move into the next round.